An indirect ceasefire understanding was reached between Hamas and Israel, on Friday at night, following extensive Israeli strikes on the Gaza Strip, and the killing of four Palestinian fighters, and one soldier. Hamas was pressured by Egypt, Qatar and Turkey to refrain from responding to the Israeli strikes, in order to avoid a serious and extended military escalation. 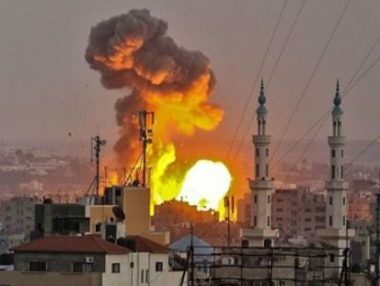 The understanding was reached after Israel shelled and bombarded more than 68 areas in the Gaza Strip, after following the death of one soldier by Palestinian fire, and four Palestinians by Israeli army fire. Lieberman also said that “the destruction and loss of live will be on Hamas,” Israeli daily Haaretz said. It is worth mentioning that the slain Israeli soldier, who remained unidentified at the time of this report, is the first Israeli to be killed by the Palestinians in Gaza, since the Great Return March procession started on Palestinian Land Day, March 30th, 2018. Meanwhile, the Israeli army killed 146 Palestinians protesters, including 17 children, two medics and two journalists, and wounded more than 16496 others. On Thursday, July 19, 2018, an Israeli army drone dropped a missile at Palestinians, east of Rafah, in the southern part of the Gaza Strip, killing one Palestinian, identified as Abdul-Karim Radwan, 22, and wounding three others, one seriously.